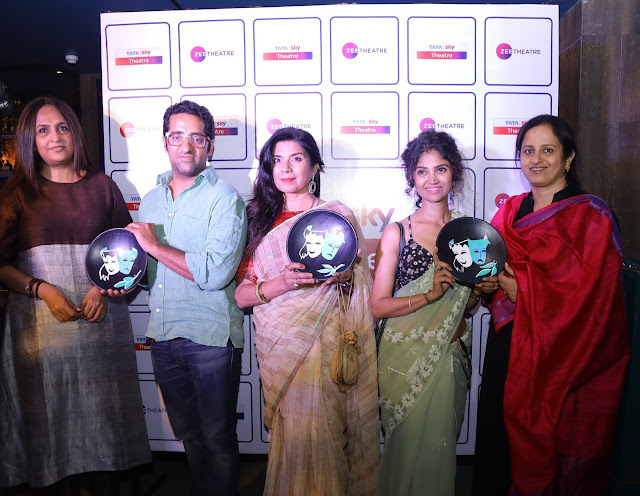 Tata Sky, India’s leading content distribution platform along with ZEE Theatre, a business vertical of ZEE Entertainment Enterprises Ltd., celebrated World Theatre Day with renowned Theatre artists Mita Vashisht, Vikram Kochar and Ratan Rajput and at JLWA in Mumbai. The event included a cinematic screening of the critically acclaimed Play ‘Wrong Turn’ along with a panel discussion on the need for archiving & televising some of the best plays in the country to enable wider reach for millennials and future generations. As a part of the celebration, Tata Sky also announced the free screening of its recently launched service, Tata Sky Theatre on 27th March at Zee’s Preview Theatre at Fun Republic in Mumbai for audiences. Tata Sky Theatre powered by Zee Theatre has a bank of over 100+ plays from across genres. Subscribers can now watch a wide variety of plays - classic, period drama, social satire, comedy, etc. at the comfort of their homes thanks to the evolving cinematic format. Tata Sky Theatre brings a special line-up of renowned Plays including the most celebrated artists and playwrights on the occasion of World Theatre Day. These include Agnipankh, Piya Behrupiya, Sandhya Chhaya, Shyam ki Mummy, Doll’s House, Bagiya Bancharam Ki, Savita Damodar Paranjpe, Wrong Turn and The Big Fat City. With this you can now watch the performances of leading stars from theatre like Mita Vashisht, Nirmiti Sawant, Milind Phatak, Joy Sengupta, Govind Namdev, Shriya Pilgaonkar, Shikha Talsania, Shilpa Shukla and Varun Badola amongst many others. Tata Sky Theatre service is available for subscribers on Channel #315 in HD and #316 in SD at just Rs.99/month and Rs.75/month respectively. These plays are also available on Tata Sky Mobile App under Live TV. Check out the service on Tata Sky Theatre! Zee Theatre aims to provide a timely boost that will help create a modern take on this form of performing arts and proudly take Indian plays on the global stage. At Zee Theatre, we aim to revive, restore and spread our rich cultural heritage by bringing together some of the finest theatre works for audiences to experience. By partnering with renowned Indian theatre veterans, Zee Theatre recreates some of the most celebrated Hindi, Gujarati, Marathi and Bengali stories with magnificent production and refreshing music based on contemporary taste. We aim to revive the inheritance of Indian Theatre for the future generation and expand the theatre universe. Make Indian plays a cultural experience for the audiences and encourage the new generation to enjoy India’s finest art form and take Indian theatre to the world.